The NEW Choice in Gondola for Today’s Retailers! Introducing the “F” Series Gondola System manufactured by Foutch Industries. Our tubular steel gondola system has a proven design utilized by the world’s largest retailers. The “F” Series gondola system has fewer components allowing for a quicker more efficient store set-up process. 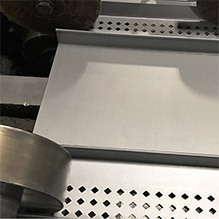 Shelves are available in both slant-nose and ticket-nose configurations with choice of perforations as well. Our pricing is extremely competitive! Foutch Industries’ centralized location in Middle Tennessee allows for fast and timely shipping across the country. We also offer affordable store fixture/equipment/supply consolidation in our modern 300,000sf facility providing today’s Retailers with a complete fixture and service package offering.